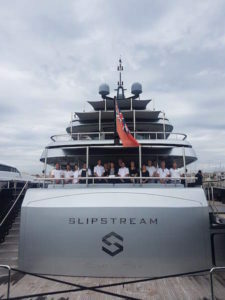 On 11th June 2018, I was honoured be invited, on behalf of the PYA, to attend a very special awards ceremony organised by ECO-MER onboard M/Y Slipstream in the port of Cannes. 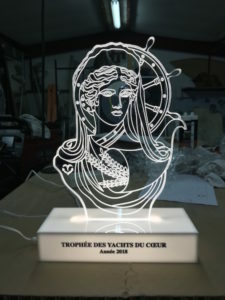 The event was to present the crew of the 60 metre yacht with the prestigious ‘Yachts du Coeur Trophy’, in recognition of the exemplary charitable work they have undertaken to provide assistance and supplies to the hurricane-stricken communities of the Caribbean Islands. The PYA was very happy to support this award. Yachts du Coeur is an initiative organised by ECO-MER, a charity established in 2009 with the aim of encouraging a sustainable marine ecology, bringing the sailing community together, and promoting responsible usage of our seas. 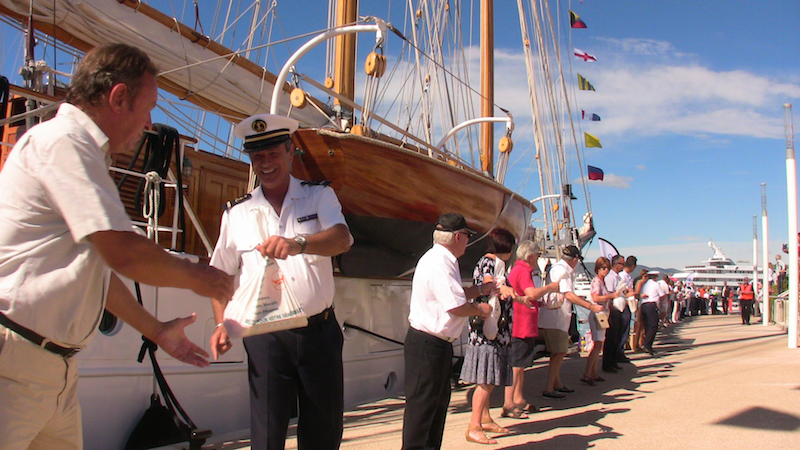 ECO-MER ran the first Yachts du Coeur event in March 2010. Since then, 22 events have taken place on the French Riviera, with the purpose of collecting food, clothes, linens and other items from yachts to be redistributed to those in need in local communities. The aims of the Yachts du Coeur collections are to provide those who are less fortunate with essential assistance, avoid the excessive wastage that can come from luxury yachts, and bring the yachting industry together as a caring and united community. In 2017, YachtAid Global got involved with the program, enabling the donations collected in France through the Yachts du Coeur to be sent further afield to those in need. YachtAid Global’s intervention allowed a small benevolent environment in the South of France to expand internationally. The PYA is delighted to have recently become an official partner of ECO-MER, and wholeheartedly supports the efforts of President Jean-Luc Annone and his hardworking team of volunteers. In November 2017, the crew of M/Y Slipstream took it upon themselves to collect donations of carpentry tools and construction materials from other yachts and local suppliers to deliver to those in need in Caribbean Islands destroyed by Hurricane Irma. Rebecca Williams, a stewardess on-board started an Instagram page, calling for help from the local yachting community. Soon, the donations starting pouring in, which the Slipstream crew took charge of coordinating. In addition to more goods donated through Yachts du Coeur events in the South of France and Italy, the yacht filled up with 38 cubic metres of supplies, before crossing the Atlantic. Once the vessel reached Dominica, Yachts du Coeur’s partner, Yacht Aid Global, took over to distribute the items locally to help those whose homes had been destroyed in the storm. Founded in 2006, YachtAld Global (YAG) organizes the delivery of disaster relief, development and conservation aid to coastal communities worldwide. The charitable crew then went to the island of Sint Maarten, where they actively got involved with humanitarian projects to help rebuild the island. This is a selfless crew who also donate a percentage of their gratuities every year to a charitable organisation or humanitarian effort, an act of generosity which is highly commendable. 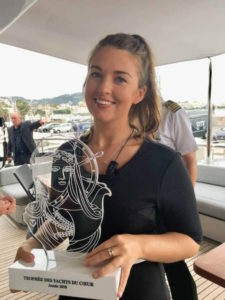 In a special and poignant ceremony, set against the background sound of the traditional AMMAC bagpipe playing, the Yachts du Coeur Trophy was presented to the yacht, with stewardess Rebecca Williams accepting on behalf of the whole crew. “Thank you to [Captains] Phil and Steve for allowing us to do this, and the whole crew. Everybody has been a huge part of it and it has definitely been a huge team effort – not just from this boat but from all the boats who have participated” said Williams as she was given the trophy by a Commander from the French Navy. 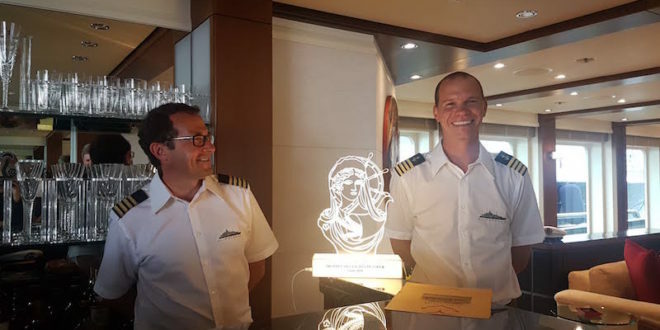 The awards ceremony was attended by representatives from ECO-MER, YachtAid Global, MYBA, the PYA, veterans of the French Navy, the Association de Marins et Marins Anciens Combattants de Cannes (AMMAC Cannes) and officials from the city of Cannes. The next Yachts du Coeur event will take place in Port Vauban Antibes 13th of October 2018. The charity is looking for donations of food (non-perishable), clothes and linen. Any help on the day to form a human chain to transport items from the yachts would be welcomed. If you are unable to attend the event but have donations you would like to make to the cause, please contact Jean-Luc Annone at Yachts du Coeur on president@eco-mer.org . Subscribe your organisation to Yachts du Coeur as an executive member, and help pay for their Ecological and Humanitarian actions. Company membership costs €1,500 per year and goes towards the cost of events, collections, promotion etc. Register at https://www.store.eco-mer.com/ .